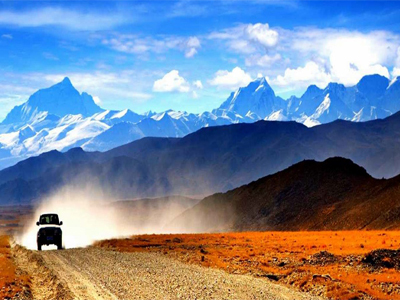 Jeep Safari, Adventure Tours For those with limited time and wanting to cover more destinations, the ideal way to explore the Himalayas is by road. 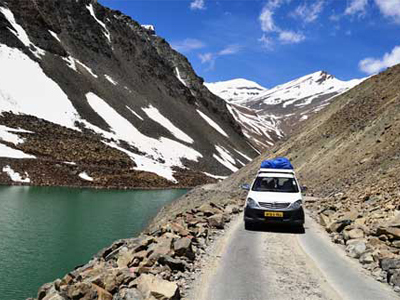 Himachal and Ladakh have an excellent network of roads passing over some of the world's highest passes and breathtaking landscapes, and with our top class jeeps and highly experienced and knowledgeable drivers and guides, we promise to make your journey a memorable one. Depart, 7 am arriving Nalagarh heritage resort at the gateway to Himachal by lunch. Check into ethnically designed rooms / suites. Post lunch, free to explore the palace or visit the hilltop Ramgarh fort. Overnight Nalagarh. Depart 8am after breakfast. Reach this quaint little hill station past Shimla by lunch. Check into hotel Mahamaya palace. Day free to enjoy the nature and ambience of Narkanda. Overnight Nalagarh. Depart 8 am arriving Sangla by late lunch. Check into deluxe Swiss tents on the banks of the Baspa river. Evening free at the camp. Overnight Sangla. After early breakfast we drive to Chitkul, the highest and last motorable point in the Baspa river valley (Sangla valley) close to Tibet. Rest of the day free to relax at the riverside or go trout fishing. Overnight camp. After breakfast drive to Puh. Enroute we stop at Recong Peo where we get permits checked/verified. Then proceed to Puh along the Satluj river in the rain shadow area of upper Kinnaur. Visit the ancient village. Overnight camp. After early breakfast cross into the Spiti area. Amidst the moonscape visit the famous Tabo monastery and the Dankar monastery. Overnight camp. Today, we visit Kye monastery and Kibber village which is believed to be one of the highest villages in the world (14600 ft ). Return to Kaza. Overnight camp. After breakfast, drive to Chhotadhara. We drive through barren grey landscape with occasional green villages which appear like an oasis in the desert. Overnight camp. Today, we cross from Spiti to Lahaul valley over the Kumzum pass (15100 ft) and then drive to the principal town of Lahaul, Keylong. Visit the Khardang monastery, then proceed to camp at Jispa where we stay overnight. After early breakfast, we drive through Lahaul. We pass the Darcha amphitheater, Zingzingbar and cross the Baralacha pass ( Approx. 16000 ft ). Camp at Sarchu and stay overnight. After early breakfast, we commence the last lap of our overland safari. We drive past Lachalung La, Pang, Debring and the beautiful Kyangshu plains. We cross Taglang La at 17479 ft, the highest point of our safari and the second highest motorable pass in the world. We drive past Upshi and come into Leh for the night at hotel Thongsol / Highland I ShambaIa. This morning is for relaxation after the exciting safari. In the afternoon proceed on a sightseeing tour of Leh town with guide, visit Sankar Gompa, Old Leh Palace, now in ruins, city gompa, Namgyal Tsemo. Overnight Leh. Today, we proceed on full day tour of the major Gompas of the Indus valley. We visit the Shey, Thiksey and the most famous Hemis gompa. Overnight Leh. Early transfer to Leh airport to board flight for Delhi. Arrive Delhi. This itinerary could also optionally start Delhi / Shimla / Sarahan / Sangla and onwards. Best time: July - Mid October. Arrive Saattal by lunch. Post lunch proceed for a half day tour to include Bhimtal and Naukuchiatal. Return to the camp by evening . Bonfire and dinner at the lakeside. Overnight camp. After an early breakfast, drive to Champawat. Enroute, visit Ritha Sahib. Arrive by lunch. Post lunch, proceed for a half day excursion to Mayawati to visit Swami Vivekanand ashram. Return to hotel I guest house by dinner. Overnight Champawat. After breakfast, drive to Pithoragarh. Enroute, visit Mt. Abbot. Arrive by lunch and check into hotel I camp. Post lunch visit to valley view point and sunset point. Return to the camp by evening bonfire dinner and ovenight camp / hotel. After breakfast, drive to Chakori. Enroute visit Patal Bhubneshwar, the famous cave temple. Arrive Chakori by lunch and check into the hotel I tourist bungalow. Post lunch proceed for a nature walk into the deer park. Return by evening dinner and overnight Chakori. After a leisurely breakfast, drive to Almora to arrive by lunch and check into the hotel. Rest of the day free in Almora.Overnight Almora. After breakfast, drive to Ranikhet. Arrive by noon and check into the hotel. Post lunch proceed for a half day city sightseeing tour. Dinner and overnight Ranikhet. After a leisurely breakfast, drive to Nainital. Enroute visit Kainichi temple. Arrive by lunch and check into hotel. Rest of the day free for boating/shopping. Overnight Nainital. After breakfast, proceed for a half day excursion to Hanumangarhi. Arrive by lunch. Post lunch half day sightseeing tour. Overnight Nainital. AM - free in Nainital. PM - drive to Delhi to arrive by evening. Corbett: Half day jeep safari and rest of the day free for nature walk. In the picturesque Himalayan range lie strange cultures. Here, breathtaking murals, crafts and art treasures have been well preserved over centuries along with its ageless and priceless monasteries. Splattered with glaciers and turquoise blue lakes, rivers and streams, this exotic land was, till recently, closed to tourists. Arrive by morning flight and transfer to hotel in Manali. Post lunch tour of the Naggar Castle and the Roerich art gallery. Overnight Manali. Drive past Rohtang La pass and into the Lahaul valley. Arriving Chotadhara by lunch. Interesting drive past one of the highest motorable passes, Kumzum La ( 4590 m ), believed to be guarded by the Goddess Kumzum. Visitors stick coins on a big rock believed to be sacred. Arrive Kaza by lunch. Overnight hotel at Kaza. Day return excursion to Kye and Kibber, near the highest in the world, (4270 m) to view the 11th century gompa. This houses a number of monks and nuns and has ancient and rare books, manuscripts, and murals on Buddhism. Serves as a training ground for lamas. Also visit Sankar monastery. Overnight Kaza. Drive past Tabo, one of the most important Buddhist monasteries, next only to the "Tholing Gompa" in Tibet. Situated on the banks of the Spiti river, it is flanked by lofty hills. Arrive Nako by lunch. Nako ( 3662m ) is the highest and largest village of Kinnaur in the Hangrang valley, famous for its lake and ice skating. Overnight hotel I camp. Fascinating drive offering breathtaking views of the gigantic Mount Kinner Kailash - the abode of Shiva. Arrive Sangla by late lunch, located in the charming Baspa valley.Overnight Wanderlust Swiss Camp on the banks of the Baspa river. Day return excursion to Chitkul, Indian village before Tibet or optionally go trout fishing in the Baspa river.Overnight Sangla. Morning free to explore the fort and later drive to Sarahan arriving by lunch. Check into hotel Srikhand. Evening tour of the 2000 year old Bhimakali temple, a marvellous combination of both Hindu and Buddhist styles of architecture overlooking the Sutlej valley. Sarahan also offer breathtaking views of the "Srikhand Mahadev." Overnight Sarahan. Drive along the Sutlej river past numerous waterfalls and streams and the famous village of Rampur and Narkanda. Check into hotel. Overnight Shimla. Morning tour of the infamous mall and the viceroy lodge. Post lunch, drive to Nalagarh fort palace. Evening at leisure to explore the ambience of this beautiful hilltop palace resort. Overnight Nalagarh. Morning, explore the fort and the orchard Machan of the former ruler of Nalagarh. Arrive Delhi ( 6 pm ) in the evening. 1. 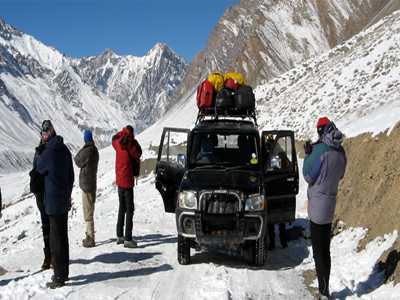 Trek in the Spiti Valley Kaza - Pin valley - Schichiling - Yangthang - Akba ( Ribla ) - Chitkul - Sangla (7days). 2. Trek to Chandratal lake. Depart for Nalagarh. Arrive at this stunningly beautiful heritage resort at the gateway in Himachal. This fortress palace rises above a 10 acre estate of forest and orchard and is built on 5 levels with well manicured green areas. Evening at leisure to explore the ambience of this beautiful palace resort. Morning, visit Ramgarh fort on a hilltop. The fort commands a breathtaking view of the plains and towns of the Punjab as well as the perennially snow clad peaks of the Himalayas. Later drive to Manali. Check into hotel. Evening at leisure. Overnight Manali. Full day tour visiting the Hadimba Devi temple in a forest clearing and the Naggar castle, a fine example of timber - bonded building that offers stunning views of the valley. Also close by is the Roerich Art Gallery. Evening, visit the bazaar to view carpet and shawl weavers near the Tibetan monastery. Overnight Manali. Drive to Jispa via Rohtang La and Keylong. Enroute visit Triloknath temple. Overnight tented camp. Drive to Sarchu. Fabulous scenery. Overnight tented camp. Drive to Leh. Check into A category hotel. Day at leisure. Overnight Leh. Full day tour of the Hemis, Shey and Thikse monasteries. Evening visit the Leh palace. Overnight Leh. Drive to Pangong Tso lake via Thak monastery crossing Changla pass ( 17500 ft ) and Tangtse rock carvings. Evening at leisure. Overnight camp at Lukung near the lake shore. Day free to explore the lake and its environs. Overnight camp. Drive back to Leh. Evening at leisure in the bazaar or visit Stok palace and Sankar gompa. Overnight Leh. Day 11: Fly Leh / Delhi. 1. 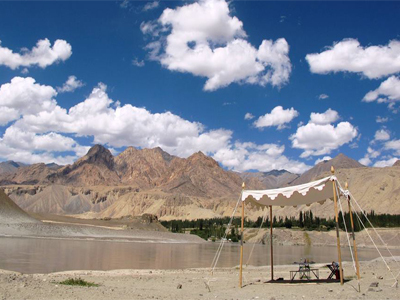 Tour of Nubra valley or Tso - Moriri lake instead of Pangong Tso lake. 2. 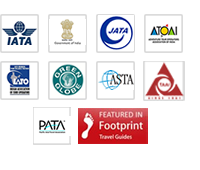 Numerous trekking trails from Leh. Best time: July to mid October.